The AWEX EMI closed on 1947c – down 16c for the week at auction sales in Australia. The key influences on the 37,405 bales remained the week on week increase in quantities of low yielding, poor for strength, drought affected lots. These lots have been attracting heavier discounts each week due to the limited competition from exporters willing to take on the additional processing and transport costs of this wool type. The pass in rate of 11.8% was influenced by a few clips offered early on Thursday resisting the new price levels and passing the entire clip in. Merino Fleece were segregated into two distinct sectors. Firstly, the good style, high yielding and specified fleece types attracted bullish competition and maintained the previous week’s levels for similar types. Secondly, is the poor for style yield and strength fleece lots which seem to reach the heavy discounts at around 54% Sch Dry Yield. These lots attracted limited competition and were generally $1.00-$1.50 clean cheaper. The fine and superfine MPG’s fell 15-27c, whilst the medium MPG’s fell just 4-5c clean. Merino Skirtings were generally 20c cheaper as a result of the first day selling but were also divided into 2 groups. The low VM lots were well supported and maintained close to last week’s levels whilst the >5%vm were up to 30c cheaper. Merino Cardings continued to fall, losing an average of 36c across all centres with all wool types affected. Crossbreds bucked the trend adding 15-20c to their MPG’s with the price emphasis on well prepared lines. 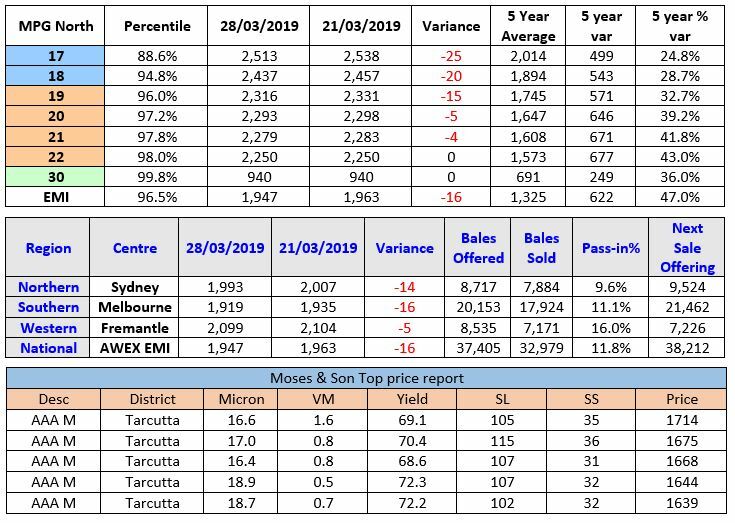 Forward Price Report from Michael Avery (Southern Aurora Wool): A mixed week for both the spot and the forward markets. The spot auction has been lacklustre for the last month and half giving up most of its new year gains. Demand fatigue, due to continued high prices, has had the market looking to establish a new support level. Restricted supply should point to this support not being far away. This was evident with pre-Easter trading this week at near cash. 19.0 traded at 2290 and 21.0 at 2250. This seems fair value to both buyer and seller on a market that has slipped 70 to 80 cents in these microns over the past five weeks. Exporters and processors have been factoring in higher price risk into the new season. Trade volumes have been solid and prices, although discounted, far exceed medium term averages. For 19-micron trades range 2150 and 2200 and 21.0 micron between 2095 and 2115. Unfortunately, volatility will likely remain as the flow of good quality high yielding wools is intermittent for the medium term. Forward levels should hold next week with exporters still keen to keep their forward book as balanced as possible. Commentary: Next week, the state committees are meeting currently to advise the national committee of the season’s progress. The statistics tell us that bales offered at auction nationally is down 178,719 bales (12.2%), whilst bales sold at auction nationally is down 209,747 bales (15.2%). Wool tested YTD in NSW is down 15.7%, whilst the national tested wool YTD is down 11% YOY; The Micron Profile has Greasy Wool production for NSW from 1st July ‘18 – to the 28th Feb ‘19 for wool finer than 16.5μ, the volume was up 86% and wool finer than 17.5μ was up 40%. As you would expect, the trade-off is that coarser than 17.5 the volumes are all down with the 20.6 – 21.5μ reducing YOY by a whopping 51%. I believe that taking into consideration the number of clips we know have shorn prematurely that the offerings post Easter may plummet.